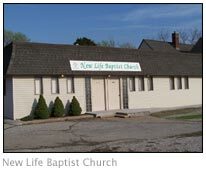 We are a Southern Baptist Church located at the 47/69 highway junction 5 miles north of Pittsburg, KS. Our purpose for existance is to first worship Jesus Christ our Savior. Second is to encourage and equip each other for His service. Third is to do our part in sharing the Gospel of Jesus Christ. I believe that the time for our Lord's return soon. For Christians, times are not getting easier. With all the things going on in our world, we can easily be distracted from our first love, our Lord and Savior. We need the Word of God on a daily basis. We need to meet together regularly to be able to stand up for Christ in these trying times. I urge you to read your Bible and pray everyday. If you don't have a church home come and check us out. If you do have a church home I urge to stay in church, stay focused on the task at hand, serving our Lord Jesus Christ. We would love to have you come worship with us. Don't hesitate to contact us for more information.